Yes, there are Chinese Jews, and yes they did live in Kaifeng. "The Legends of the Chinese Jews of Kaifeng"
In the ninth century, Kaifeng was one of the largest cities in the world. Some 600 kilometres southwest of Beijing in East-Central China, Kaifeng boasted a population of nearly 1 million people. Located on the silk road, Jewish merchants and their families heading east from Persia arrived and settled finding acceptance of their customs and freedom from persecution. Thus started one of the most remarkable stories of a Jewish community that existed totally isolated from any outside Jewish contact. 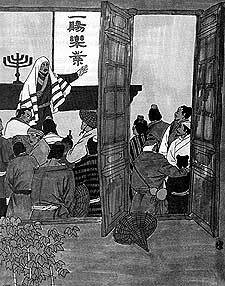 Completely unknown to the western world, the Jews of Kaifeng maintained a synagogue, mikvah, kept kasruth and practised the rite of circumcision for nearly 1000 years. 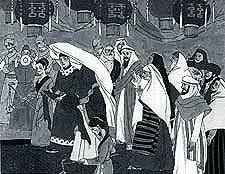 They called to meet the Song Dynasty Emperor Hsiua Tsung and presented him with gifts of fine cloth. The Emperor was delighted and honoured them by letting the Jews use the surnames of Zhao, Li, Ai, Zhang, Gao, Jin and Shi. The community prospered in Kaifeng but many times their synagogue was damaged or completely destroyed by flooding from the Yellow River. The constant rebuilding may have played an important part in their maintaining their Jewish identity and sense of community, in a country that had freely accepted them and was in danger of assimilating them. In Marco Polo's travel diary he describes his meeting Jews in China in 1286. 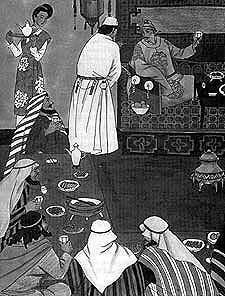 He reported that Kublai Khan celebrated Jewish festivals along with Christian and Muslim holidays. Some 300 years later, in 1605, Ai Tien a senior of the 1000 strong Kaifeng community, decided to travel to Beijing since he had heard of a congregation that prayed to only one God. He was unaware of Christianity and presumed them to be Jews. He presented himself to their leader Father Matteo Ricci as members of the same religion. Ai Tien was thought to be a member of a long lost Christian community until their differences became apparent. However, Father Matteo wrote to the Vatican with the news of the Jews of Kaifeng. Many missionaries were sent and there were many unsuccessful attempts to convert them. They were also keen to see their Torah. Rome believed that the coming of Jesus had been removed from European Torahs ! Amongst the Jesuit missionaries was Father Jean Domenge, who, in 1722, sent a series of drawings of Jewish life in Kaifeng back to Rome. One of these depicts Jews in front of the Ark, and can be seen in the Kaifeng restaurant in Hendon. After another flooding the 19th century the synagogue fell into ruin. There were no more Rabbis and the community became more and more assimilated. Today if you ask to meet Jews in Kaifeng, you will meet people who "do not eat pork". Because their families never did. The proof that they really are descended from the Jews of Kaifeng? One does not accept the other as truly Jewish.